January 9, 2019, New Delhi:The ecommerce sector is becoming the next big thing in India, or probably it already is! So far, the primary focus of the ecommerce sector has been about price, convenience and product selection. 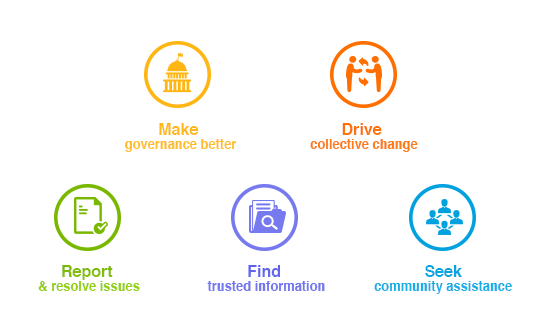 However, to make the sector sustainable and enable its long-term growth, it is critical that trust and customer service aspects are focused upon. eCommerce forms a sizable portion of consumer experiences and across many circles of LocalCircles, consumers have been highlighting issues in ecommerce and how it can be made better. Since the conversation on ecommerce policy came to light, the conversations around ecommerce have only grown as many consumers see the policy as an opportunity for some standards to be set and provide clarity on the do’s and dont’s as far as the ecommerce sites go. 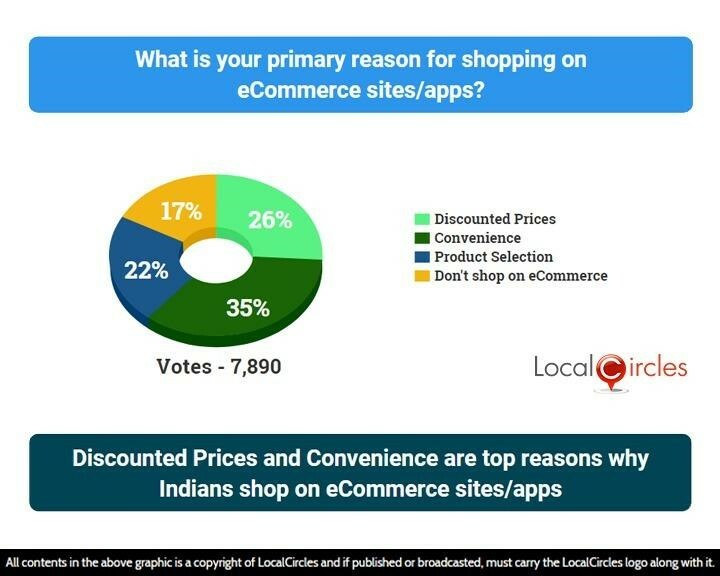 35% said that the primary reason for them to shop on ecommerce sites/apps was convenience and 26% said it was discounted prices. 22% also said that a wider product selection led them to shop on ecommerce apps while 17% said they don’t shop on ecommerce. 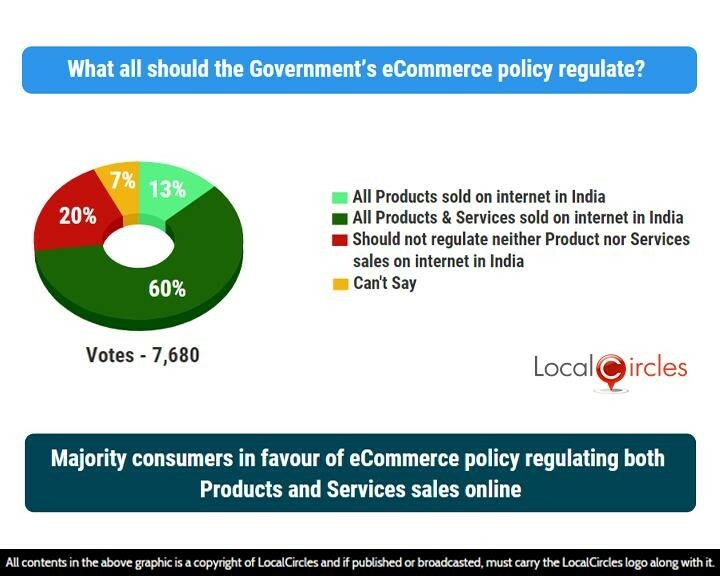 60% respondents said the ecommerce policy should regulate all products and services sold on internet in India and 88% said that platforms like Facebook and WhatsApp should also be subjected to ecommerce regulations. 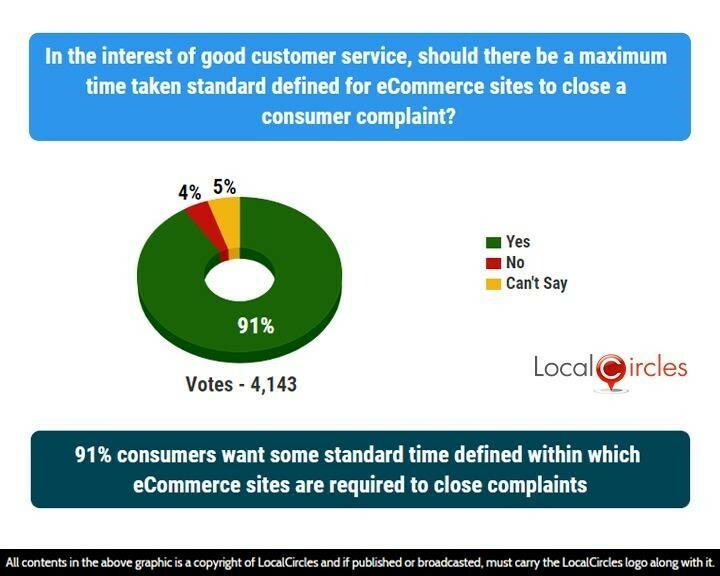 93% said ecommerce sites should acknowledge complaints within 72 hours while 91% said a maximum standard time should be defined for them to close all complaints. 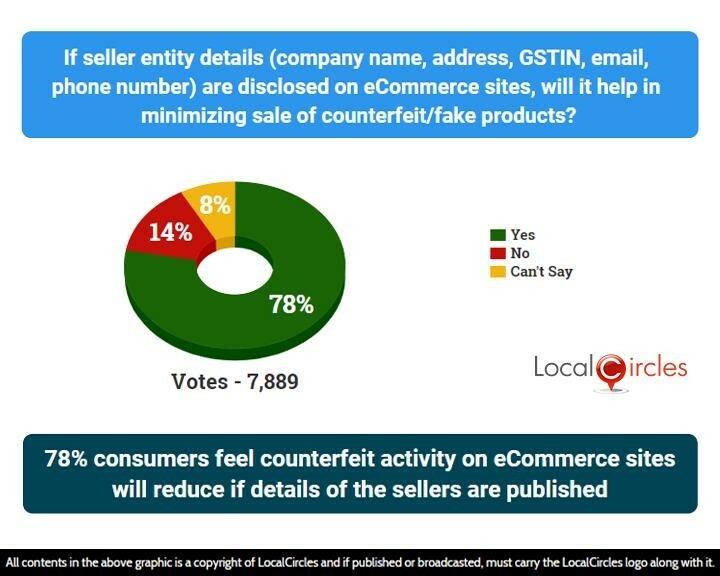 78% said that the counterfeit activity on ecommerce sites will reduce if the details of the sellers like GSTIN, address, name etc. were published on the site and 86% also want the ecommerce sites not to charge the consumers on counterfeit products. 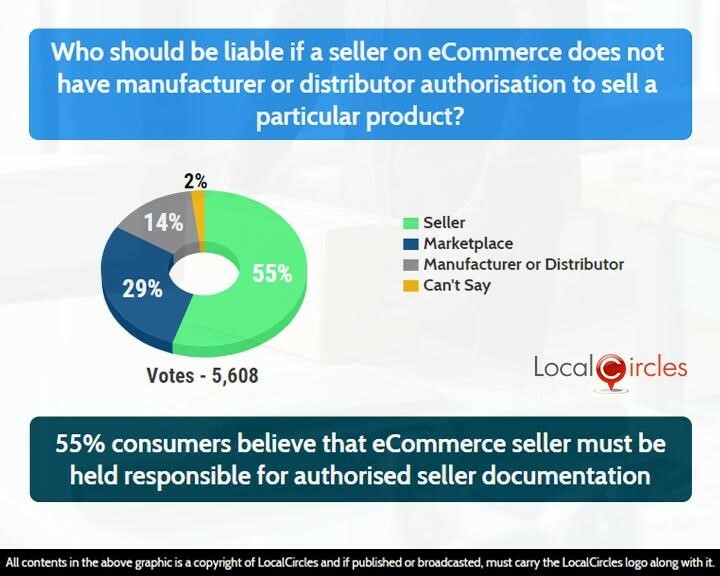 55% consumers believe that ecommerce sites should be held responsible for authorised seller documentation. As DIPP designs the ecommerce policy, consumers say that the ecommerce sector should be regulated, and any policy should cover both products and services aspects of the ecommerce industry. Also, issues like discounts, cashbacks and efficiencies obtained through bulk buying must be left to the market forces, so the consumer benefits are maximised. At the same time, safeguards must be built against malpractices like counterfeit products, fake reviews & ratings and poor customer service by design. Detailed polls can be found further in this document. Ecommerce sites these days don’t just sell products, they also sell services online. These include sale of tickets, hotels, taxis, insurance, food delivery etc. The first question asked what all should the Government ecommerce policy regulate. 60% respondents said it should regulate all products and services sold on internet in India. 13% said it should regulate only products sold online. 20% said it should not regulate either and 7% were unsure about it. 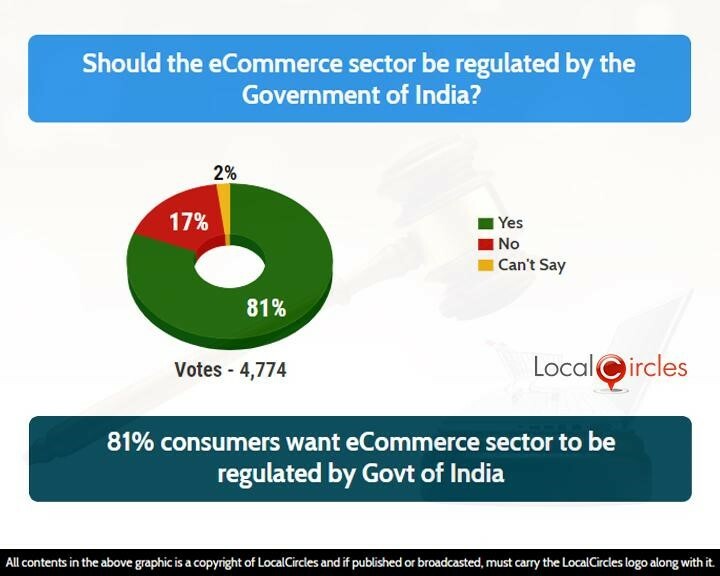 81% consumers want ecommerce sector to be regulated by the Government in India. Only 17% voted against the move. Platforms like Facebook and WhatsApp have also opened channels where selling and purchasing of products can take place. Most of these sales do not follow any regulations. Pictures of the products are shared, money is received, and products are shipped. 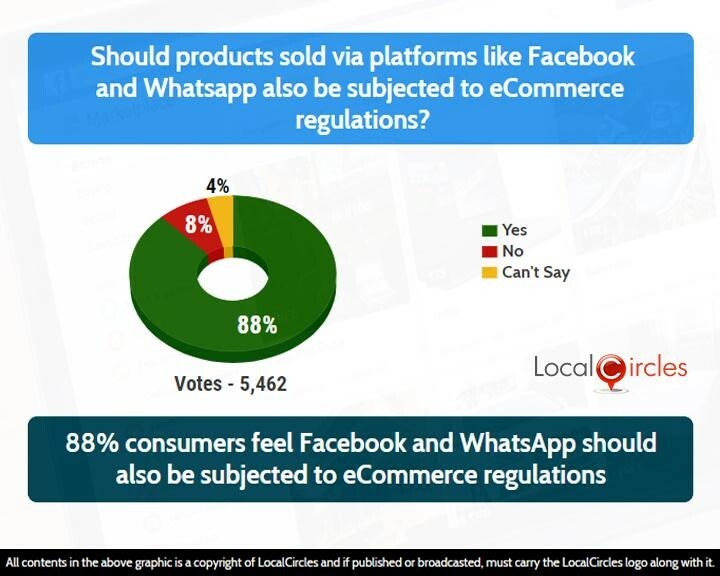 Citizens were asked if products sold via platforms like Facebook and WhatsApp also be subjected to ecommerce regulations. 88% citizens answered in a ‘yes’ while only 8% answered in a ‘no’. The new announcement around the ecommerce FDI policy might mean that big discounts and cashback on online shopping may soon be a thing of past. Although the government’s decision of making changes to the FDI policy for ecommerce in India is aimed at the betterment of the smaller retailers and making a level-playing field, the consumers will have to shell out more to buy products online. 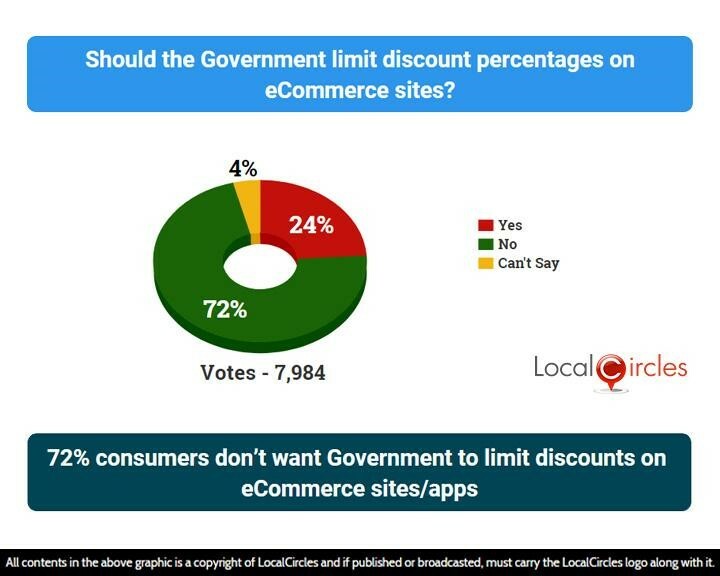 The next question asked if the government should limit discount percentage on ecommerce sites. 72% voted against it while 24% voted for it. 4% were unsure. Some seller companies which were partly owned by the ecommerce sites themselves, have lately launched their own private brands and have captured a large part of the sales on those platforms., making it unfair for the smaller sellers to operate on the platform. Cashbacks are a big component of an ecommerce company’s marketing campaign. On one hand it encourages repeat visits by customers, and on the other hand it helps customers get better discounts. 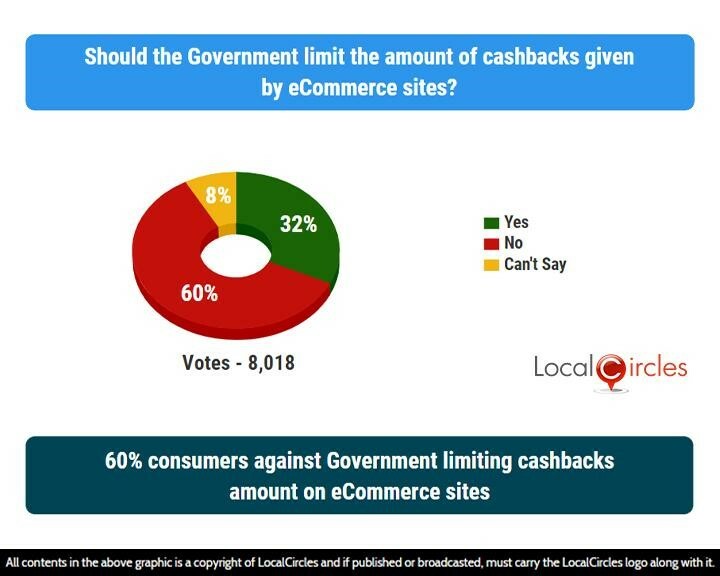 The next question asked if the Government should limit the amount of cashback given by ecommerce sites. 60% answered in a ‘no’ as it is beneficial to the consumer while 32% answered in a ‘yes’. 8% did not have an opinion on it. 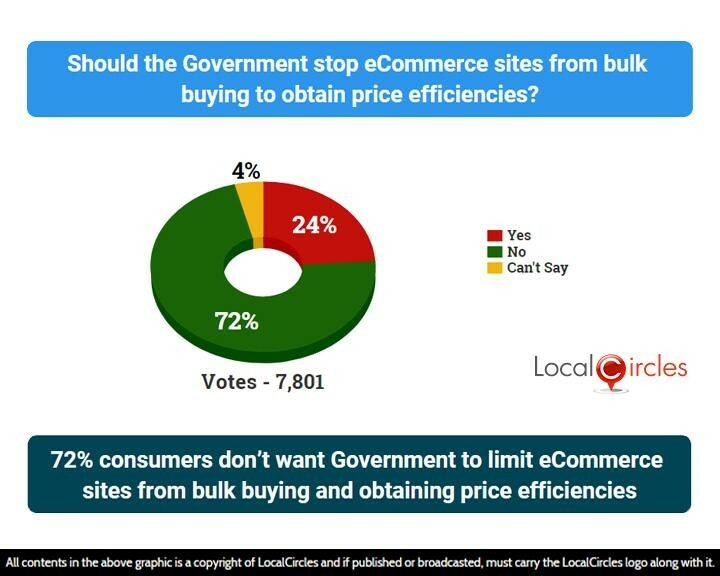 When asked if government should stop ecommerce sites from bulk buying to obtain price efficiencies, 72% voted against it and 24% voted for it. 4% were unsure. Customer service is an important aspect of the sales and marketing process in India. While buying a product, consumers evaluate the level of customer service they will receive post the purchase. 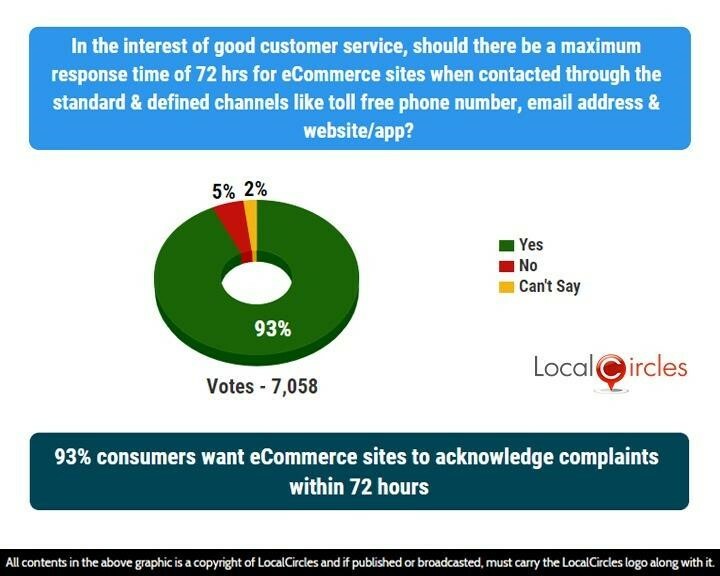 In the interest of good customer service, citizens were asked if there should be a maximum response time of 72 hours for ecommerce sites when contacted through the standard & defined channels like toll free phone number, email address & website/app. 93% voted in favour of it while 5% voted against it. The next question asked if there should be a maximum time taken standard defined for ecommerce sites to close a consumer complaint. 91% said yes and 4% said no. 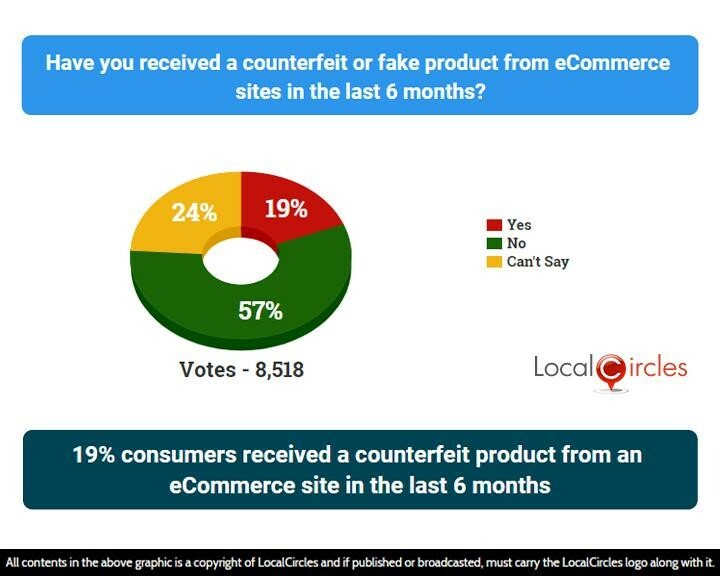 Consumers were asked if they had received a counterfeit product from an ecommerce site in the last 6 months. 19% answered in a ‘yes’ while 19% answered in ‘no’. 24% were unsure. 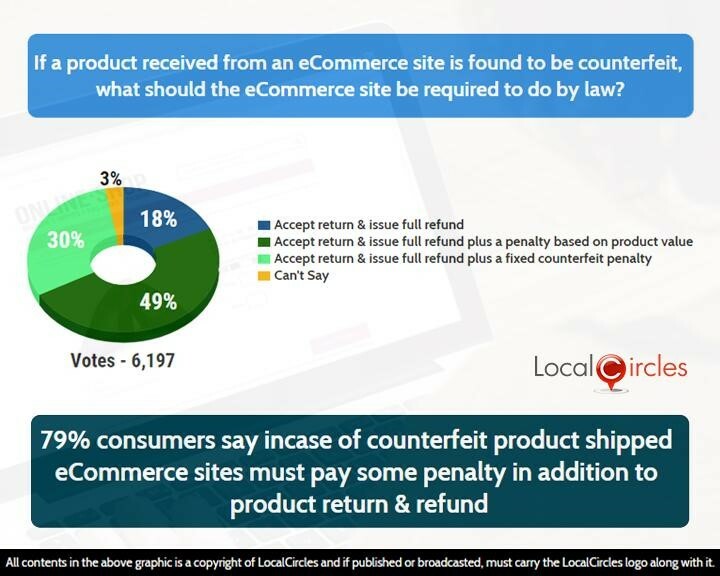 When asked what an ecommerce company should be required to do by law if a product received from them is found to be counterfeit, 49% said they should accept return & issue full return plus a penalty based on product value. 18% said they should just accept returns and issue a full refund. 30% said they should accept return & issue full refund plus a fixed counterfeit penalty. 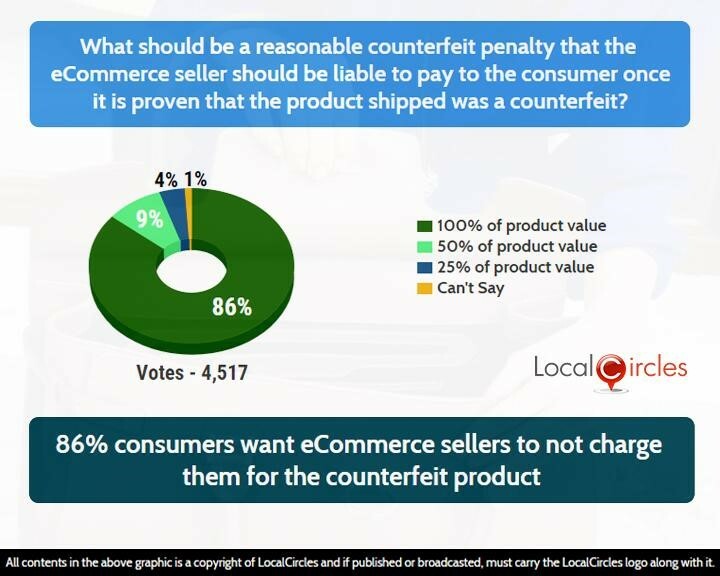 The following question asked what should be the reasonable counterfeit penalty that the ecommerce sellers should be liable to pay to the consumer once it is proven that the product shipped was a counterfeit. 86% said it should be 100% of the product value, 9% said it should 50% of the product value and 4% said it should be 25% of product value. Consumers also demanded that the ecommerce portals should take steps to ensure that the products sold on their site are genuine. The following question asked if the seller entity details (company name, address, GSTIN, email, phone number) are disclosed on eCommerce sites, will it help in minimizing sale of counterfeit/fake products. 78% said yes while 14% said no. On the question on product reviews on ecommerce, consumers were asked if they have experienced significant variation between a product review on ecommerce site and the actual product received. Surprisingly, 62% consumers replied with a yes, while 27% replied with a no. 11% chose not to answer. 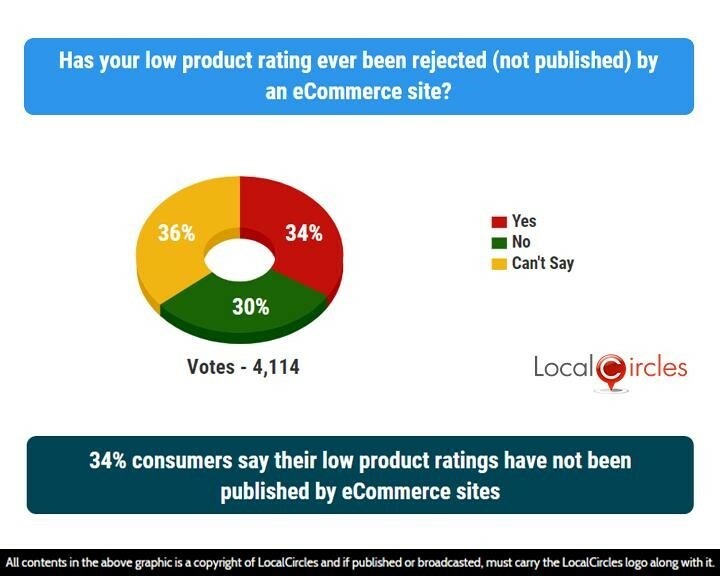 Following poll asked consumers if their low product rating had ever been rejected (not published) by an eCommerce site. 34% consumers said it has personally happened with them and 30% said it had not happened with them. 36% were not sure about it. 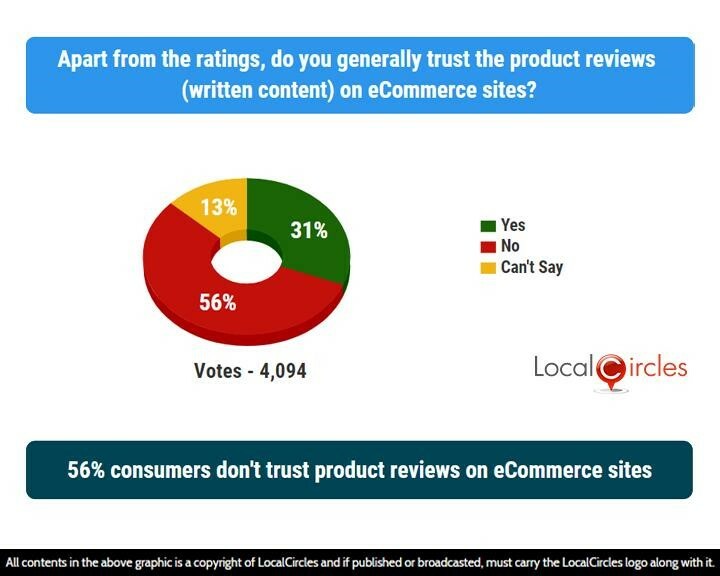 When asked if they trusted the product reviews on ecommerce sites, 56% consumers responded in a negative while 31% responses were an affirmative. 13% were unsure about it. 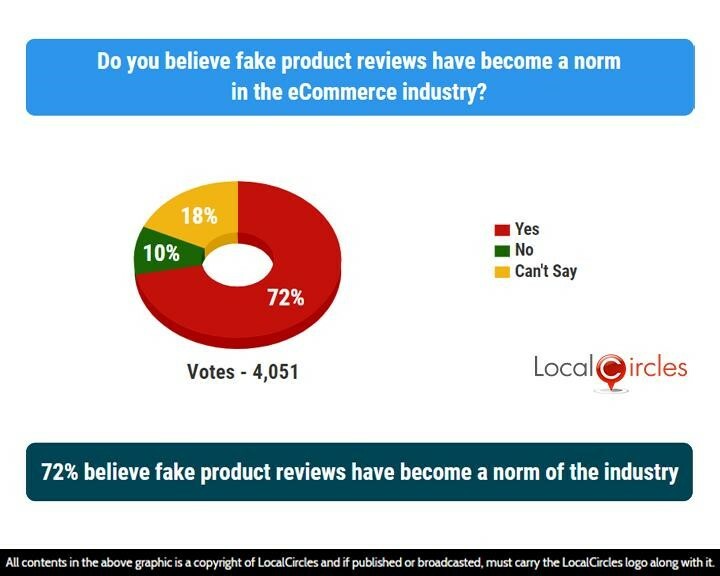 In the last poll, 72% consumers said that they believe fake product reviews have become a norm in the eCommerce industry. 10% said this was not the case and 18% were unsure about it. Consumers mentioned that many businesses are thriving on their ability to provide fake ‘good reviews’ to the prospect buyers and in most cases once a business lists a product, the seller himself as an individual goes and rates and reviews the product. It is also very common for them to ask family and friends to rate and review their product. Some sellers even go to the extent of making a purchase from their own business so as to getting a “verified purchase” rating and review for their product. Consumers must take into account the number of ratings and reviews when buying on eCommerce sites, suggested some LocalCircles members. According to an estimate by the finance ministry, the size of the digital economy in India will be $1 trillion by 2022 and it will account for close to 50% of the entire economy by 2030. While the consumers want the government to design a strong and inclusive ecommerce policy in the country, they want the discounts and cashbacks offered by ecommerce companies to continue. Over 110,000 responses were received from 45,000+ unique citizens located in 220 districts of India. Approximately 44% of the respondents were women while 56% were men. 61% of the participants were from Metro/Tier 1 cities, 29% from Tier 2 cities and 10% were from Tier 3 and rural locations.